This week's post is a lot more personal than I've been getting. Honestly, it's hard for me to go down this road and share with you like this. It's much easier for me to share information that I've experienced to be vital for wellness and healing, but is still mostly objective. I hide behind my journalism training, I'll admit. I know it can make it harder for you to connect with me in a more personal way. But now I'm ready to share this with you. My accident left me with 14 broken bones. From my left foot to my cheeks, I was in pieces and my orthopedic surgeon literally put me back together. I am so grateful and because of him, I can walk but the accident and the repair of my body left me with scars. Big ones. Many visible, many unseen, and all difficult to bear. The images below are different stages of repair in my left femur. Broken, after the rod was placed and a year and a half later. 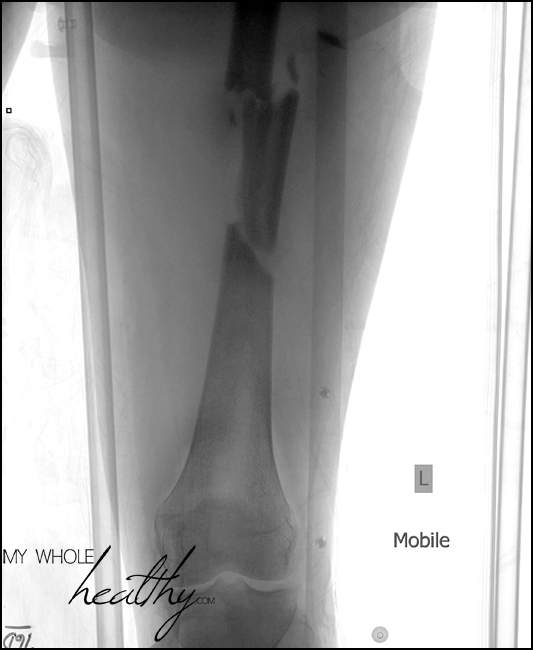 The uneven modeling of the healed bone is still like that - I can feel it - and the rod will stay in my leg for life. For years, every time I'd look in the mirror, I'd cringe when I saw the marks on my skin reminding me of the trauma and fear and pain I had experienced. And the emotional scars inside, usually kept safely out of sight, would surface at the most unexpected and inopportune times, making me cry spontaneously in front of complete strangers. It was awful. I hated how my physical scars looked and I was so sick of CRYING so damn much. I have never cried so much in my life as I have over The Accident. But one day one of my best friends, Mel Says, showed me the Instagram account of a tattoo artist named Dr. Woo who tattoos at the Shamrock Social Club in West Hollywood . I already had a few smallish tattoos on my back but when I saw his work, I was enchanted. I NEEDED to get a tattoo from this man and although my first ideas where for something small to fit with what I already had, I suddenly had the idea of covering one of the scars on my thigh. And then I realized if I was considering covering one, why not cover all of the scars on my upper leg?! I felt they were my most glaring and ugly scars and I hated them so much. Living in California, we can go to the beach year round and I'd had people ask me, "what happened?!" when they saw them. Those scars forced me to re-live what had happened every time they were exposed and I needed to be free of them in order to continue my healing. I also knew that plastic surgery or cosmetic dermatology meant more medical intervention and likely over $10,000, neither of which appealed to me! So I got in touch with Dr. Woo and scheduled my first session for around my birthday. When we started, he used a pencil sketch and some photos that I brought him to draw a freehand design directly on my leg with markers. There were very few changes. His design was perfect. As he started to tattoo the outline and I felt the pain of the tattoo needle, I remember being overcome with gratitude. Even though it hurt, I felt so grateful to be alive, to be feeling the discomfort, and to be there in that moment, getting this incredible piece of custom art tattooed on my body. The emotion brought tears to my eyes but I breathed through it, desperately not wanting to cry in front of the "tough" tattoo guys in this iconic shop on Sunset Boulevard! I know now they would have been very sweet if I had cried, but still. This tattoo started as a way to cover my scars, to hide the ugly and try to erase this piece of the trauma... but as time went by, I realized this tattoo had allowed me to transform these scars into something beautiful. The scars are still there, I cannot erase them and they are still deep and painful and I feel them every day, but they no longer have power over me. When I look in the mirror and see my tattoo, I don't see my scars anymore and I can smile. What I see now is this amazing, gorgeous tree. Gnarled and weathered, twisted by growth and wind and life, but standing strong and budding out as if in the spring, full of life. When I see it, I remember the experience of my sessions at Shamrock where I was in amazing company, instead of being reminded of the worst moment of my life. It was truly transformative, physically and emotionally. Dr. Woo and the other tattooers in the shop laughed and talked with me through hours-long sessions (my longest one was 5 hours!) and made the whole experience more positive than I could have hoped for, and guys, if you read this, I am still so grateful. Thanks. Dr. Woo was incredibly kind and easy to talk to, and he made the whole experience more than worth the 2+ hour drive to see him. This video about Dr. Woo went up on MrPorter.com recently and you should watch it and read the article. It'll give you a good idea of the man he is. I feel really blessed to have discovered him and had him be the one to do this tattoo for me. The script written in the bark of the tree carries a lot of meaning for me, as well. If you follow me on social media, you've probably seen me post some images with quotes about courage. This script is a quote about courage too, from my favorite book,The Deed of Paksenarrion . It reads: "It is courage that splits the acorn and sends the rootlet down into the soil..." and speaks to how courage is inherent in all living things. It is not a thirst for conflict, but just a quiet little piece of ourselves that is incredibly brave and always present. It reminds me that courage is not something I need to get from somewhere else - it is in me already and is always there when I need it. This idea, and that whole book, pulled me through some very dark times. If you enjoy well-written fantasy novels (not cheesy), I highly recommend it. The tattoo also helped me feel like I had control over what happens to my body again. I didn't ask for the injuries, and as grateful as I am to my surgeons, I didn't get to consent to surgery either. I was unconscious (or close to) and all the repair was done out of necessity - not because I asked for it. It all led to me feeling like I had given up control over my body, which is not like me at all under normal circumstances! Getting tattooed was a way for me to take what had happened to me and make it my own again. I was now in control of what my skin looked like, of what people saw, and what it meant. My body has many other scars that are not tattooed, but tattooing this part of me helped me to start accepting my other scars as they are. It helps that they are fading with time, for sure, but I still feel them running deep through every layer of skin, fascia and muscle, right to the bone. I feel the adhesions that restrict my movement, I feel the changes in the bones that keep me from using my body in every way I'd like to. I'd be lying if I said I've fully accepted my body the way it is now because I truly believe I can still regain more of what my injuries took from me. But I've come to terms, more or less, with how my scars look and I know that they serve a purpose. My scars are part of me and they help me to practice yoga everywhere in my everyday. They help me with mindfulness. Did you know yoga means union? Yoga stretches far beyond the mat and my scars remind me to be grateful for everything I have and also serve to show others who have been through similar stuff that I know what they suffer. That's really the driving force behind my desire to help people; to help you. I've been through some of the worst imaginable stuff, but I got through it. I've been "there" and I know suffering. But I also know it gets better and I want to help people achieve a recovery they feel equals "better". Because that's all that matters - that you feel "better", not that other people see you that way. No one can know what it is to be "all better" except you, the one who went through it. Am I the same? No way. But no matter what we go through, life changes us and we are never the same. The trick is knowing how to accept the things we cannot change and integrate them into who we are now, and love those parts of ourselves! It is also having the strength to put in the time and work needed to heal or strengthen what can be changed. And to seek help when it's needed because no one can do it all, alone. It's not easy but there is a way. I want to help you find your way. The banner image at the top of the page (and cropped below) shows the surgical scar on my left arm. It is where my humerus was repaired with a plate and screws. When I squeeze my arm, I can feel the lumps where the bone healed in a less-than-perfect way but it's part of me now. I still have some pain in my elbow when I lift weight or do certain exercises at the gym, and even in some yoga poses, but it's getting better and I'm learning how best to use my arm so it doesn't hurt. Feeling cute, comfortable, and supported in my YOGiiZA top helps too. Funny how feeling good in other ways, like a wearing a cute outfit, can make the tough stuff a little easier but it totally does! I am bionic now and this hardware will be in me until the end. I've inquired about having it removed - I had the rod taken out of my left tibia last year! But the rest is too difficult to remove and could do more harm than good. My arm has delicate nerves that could be irreversibly damaged by more surgery, and the rod in my femur is completely inside the bone - removing it would mean essentially breaking my leg again. No thanks. I am scarred but now I know that my scars show that I have lived. None of us get through life without them, whether they're physical or emotional. Learning to make my scars my own and accept them has allowed me to reach another level of healing. It's like forgiveness, when we stop being angry. Hating my scars was only hurting me more and preventing me from healing a part of myself. I am still aware of every mark of my body but I am simply mindful of them. Aware, but not grieving their presence. They serve me now, in a way, to bring yoga and mindfulness into my life every day. If you read my interview with Bethany at From the Pasture, I talked about how yoga was one of the most helpful things I did for my healing. It still is. You will probably see my other scars show up in photos in my blogs or on social media... I hope seeing mine helps you to accept yours in some way. I can talk about them now so if you have questions or need to share something, please feel free. Comments, email, I'm always listening.